The newly constructed, 56,000 square-foot W. Baxter Perkinson, Jr. building is the latest addition to the VCU School of Dentistry. The building is currently pursuing LEED-Silver certification, incorporating sustainable features such as advanced water and waste recycling, sustainable building materials, and energy efficiency and conservation technologies, such as windows, HVAC, and appropriate siting to maximize passive solar energy. 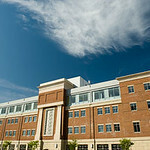 In addition to providing classroom and dental clinic space, the building also provides advanced research laboratories.